The precious metals markets opened slightly lower this morning following a strong performance last week. Traders came upon the realization that Federal Reserve Chairman Ben Bernanke was giving false signals when he suggested several weeks ago that the Fed would likely wind down purchases of Treasuries and mortgages. We should think so! After the Fed made these outlandish claims that it would roll back its insane monetary interventions, the bond markets fell dramatically, and mortgage interest rates shot up at their fastest rate in decades. Fed officials had to change their posture on "tapering" before it even began. Consequently, gold and silver futures, which had been priced as if the end of Quantitative Easing was a certainty, put on one of their best weekly performances this year. Have we seen the bottom? It is impossible to say. The markets are obsessed with "Fed Speak" – perhaps the most confusing signaling device investors have ever grappled with. Maybe this most recent flip-flop will shake the credibility that Bernanke and his cohorts still seem to enjoy. It's certainly frustrating to see the markets whipsawed in every direction in reaction to every utterance. However, Federal Reserve intervention may be the most important dynamic at play anymore... so it's not surprising to see "Fed watching" becoming a national pastime. As Money Metals Exchange has reported previously, the divergence between activity in the bullion markets versus the paper markets is striking. 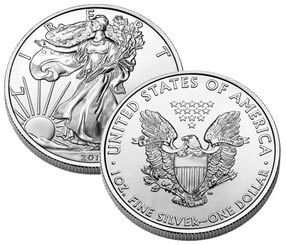 Traders in the precious metals futures markets may have been selling aggressively and driving spot prices lower in recent months, but buying demand for physical bullion in the form of the silver American Eagle coins has never been higher. Actual sales of all bullion products are impossible to calculate, as dealers do not report sales. However, the U.S. Mint's report on sales of their Silver Eagle bullion coins is a strong indication of high demand market wide. The U.S. Mint is on pace to set an all-time record in sales of the silver American Eagle. It may deliver more than 50 million ounces of retail silver in 2013 – a number which would crush the previous record at nearly 40 million set in 2011. This despite significantly higher premiums, with the dysfunctional government agency even suspending sales for nearly two weeks in January as demand overwhelmed their ability to produce. Sales of gold Eagles aren't far behind this record pace. At the current rate, the Mint will ship more than 1.2 million gold ounces by year end. Year-to-date gold Eagle sales are nearly double that of the same period last year. Demand for physical coins, rounds, and bars is testing all fabricators' ability to produce them – not just the U.S. Mint. Premiums and lead times spiked dramatically after the April price correction spurred massive buying. The most recent slide in spot prices has once again spurred demand, and we are seeing renewed upward pressure. Monday, July 15th – Retail Sales. Consumers have been driving modest growth in retail sales and consensus is for this week's report to reflect more of that. Tuesday, July 16th – Consumer Price Index. As we have often stated, adjustments to this measure of inflation understate the real inflation statistics. Ongoing QE efforts and the Fed's newly created money are currently driving up stock market prices but not precious metals or consumer prices. That will eventually change. However, low CPI numbers will help the Fed rationalize ongoing stimulus. Wednesday, July 17th – Housing Starts. Mortgage rates recently spiked higher. Investors may get a glimpse of the impact in this week's report. Applications for new mortgages have already fallen significantly.